Sand Mountain is a large sand dune a half-mile north of U. S. Highway 50, about 26 miles east of Fallon, Nevada. Sand Mountain is 2 miles long, a mile wide and more than 600 feet high. This perfect hill of fine bleached sand has blown into a box canyon over thousands of years from the flats of Lake Lahontan, an ancient sea now dry. The huge pile of sand is available to ATV enthusiasts who buzz up and down the dune, with the constant winds covering the tracks in short order. About 10,000 years ago glaciers filled many of the valleys in the Sierra Nevada to the west. The cool, wet climate and runoff from these glaciers had created an immense inland lake now known as Lake Lahontan, covered some 8,500 square miles including most of northern and central Nevada and parts of Oregon, Utah, California and Idaho. But as the climate grew warmer and the glaciers retreated, the lake slowly started to dry up. About 4000 years ago the lake level dropped below where Sand Mountain now stands. All that remains are Pyramid and Walker lakes and a handful f dry lake beds such as the Humboldt and Carson sinks, the Black Rock Desert and Winnemucca Lake, near Pyramid Lake. Meanwhile quartz particles, which the glaciers had ground away from the hard Sierra granite, were washed down the Walker River and deposited in the river's delta. As the wind blew across the delta this sand was picked up and carried high into the air. More than thirty miles to the northeast, the wind was slowed by a large basin on the southwest flank of the Stillwater Range. With its force broken by the mountain, the wind's burden of sand would fall into this natural trap. Over the centuries Sand Mountain grew until it reached its present height of almost 600 feet. The wind is constantly changing the shape of Sand Mountain and sometimes the shifting of the sand will produce a soft rustling, or even an eerie booming sound. This unique characteristic has earned Sand Mountain its nickname of "Singing Mountain". The Sand Mountain blue butterfly (Euphilotes pallescens arenamontana) inhabits only this single sand dune in Churchill County. 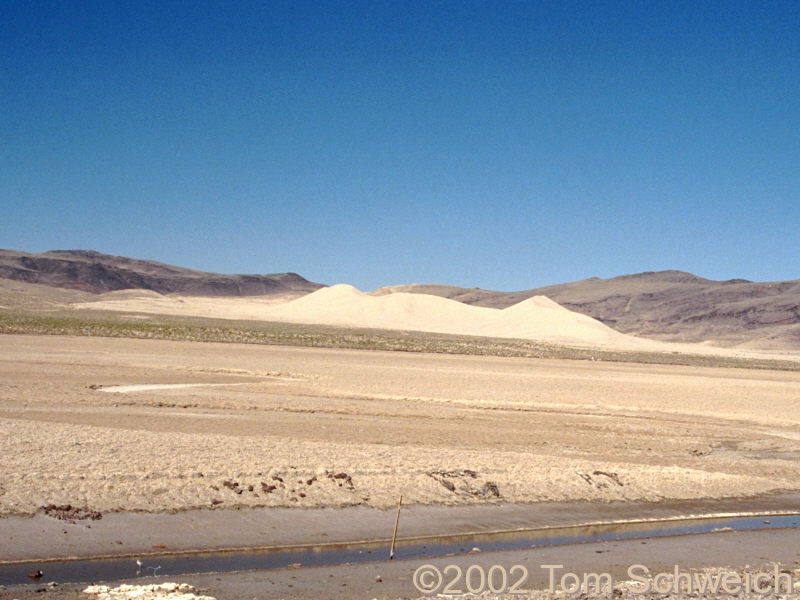 Singing and Booming Sand Dunes of California and Nevada: Sand Mountain, Nevada. U. S. Highway 50: Sand Mountain. Other photos about Geography - Nevada or Churchill County.